Details: The JW Rubber Brush has a round head with raised rubber nubs which are gentle on the pet's skin. Ideal for daily brushing the JW Rubber Brush is suitable for use on all coat types. Use to massage the skin, increasing circulation and promoting a healthy coat. 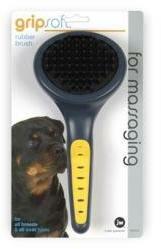 The JW Rubber Brush is an ideal shedding tool for removing loose hair & dirt on short coated breeds.